Use the following steps to access and run the Internet Speed Check tool. 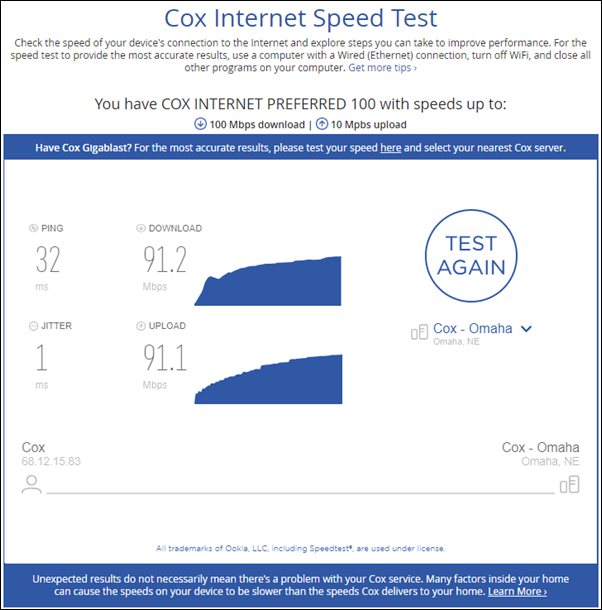 Before running the tool, it is important to note that the Internet Speed Check tool is designed to be used when connected to the Cox network. The Internet Speed Check tool is not compatible with any iDevice, including iPad, iPhone, or iTouch. To view the speed test results, Flash is required. In a web browser, go to https://www.cox.com/residential/support/internet/speedtest.html. Enter your primary User ID and Password, then click Sign In. On the Check Your Internet Speed page, click Start Test to begin the speed test. Note: You can run the speed test five times per day. Result: Once completed, Your Results display on the page. Note: Scroll down the page to learn ways to improve your Internet speed.